Produced by MandalMotors, the M3-A Interceptor—also known as the "Scyk" fighter—was a lightweight and lightly shielded starfighter that was popular among the Hutts and Car'das smugglers due to its low cost. 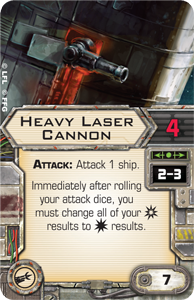 Although the fighter scarcely featured more amenities than a TIE fighter, its weapon mount could handle nearly anything, so the ship was frequently customized for its role in battle. 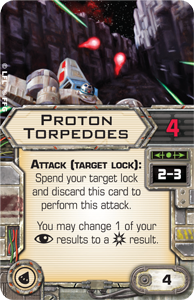 In X-Wing™, this customizability has long been represented by the "Heavy Scyk" Interceptor Title, which grants it the ability to wield missiles, torpedoes, or a cannon. 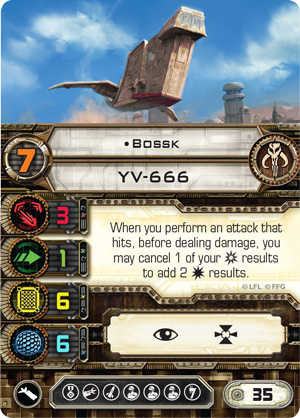 But the Scyk's customizability will soon gain another boost with the upcoming release of the C-ROC Cruiser Expansion Pack. 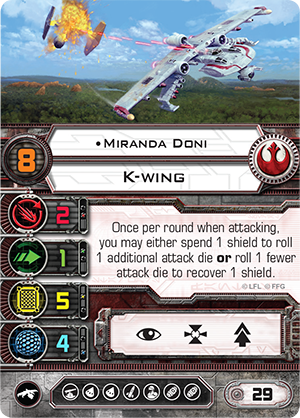 Even as the expansion takes the Scum faction into Epic, new, uncharted territories with its huge C-ROC Cruiser, it presents a new M3-A Interceptor miniature with an alternate paint scheme—and this is accompanied by an array of upgrades and M3-A Interceptor pilots that allow you to fly the fighter in all-new ways. 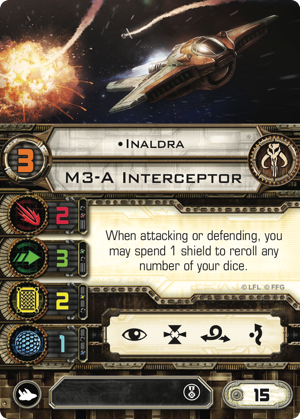 A 360-degree view of the M3-A Interceptor miniature from the C-ROC Cruiser Expansion Pack. There are many legends in the Star Wars galaxy, and while they aren't all true, there's generally a kernel of wisdom hidden within all the most durable of these legends. 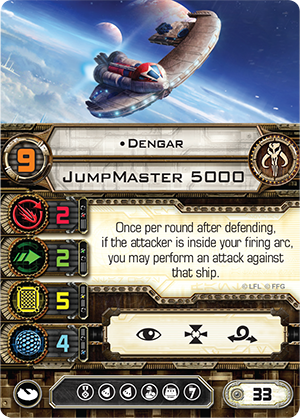 And the Scyk fighter plays a prominent role in one of these legends—that of the battle of Tansarii Point Station. As the legend holds, Tansarii Point Station was a space station that orbited Ord Mantell. It was run by the smugglers and pirates of the Car'das, and though it was a disorganized and troubled station, it still served as a hub of business between various crime syndicates until the Black Sun launched an attack against it. And it survived the attack due to the efforts of the Scyk pilots who flew in its defense. 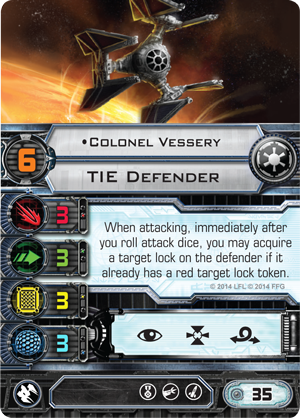 These Tansarii Point Veterans have flown the Scyk in X-Wing since it first launched, but we get more of them in the C-ROC Cruiser Expansion Pack. Not ony do we find another Tansarii Point Veteran ready to fly the ship, we get the commander of Tansarii Point herself— Inaldra . With only two hull and a single shield, the Scyk isn't designed to withstand sustained fire. You need to strike hard and fly away until you can line up another favorable shot. And with her unique ability to spend a shield in order to reroll her attack or defense dice, Inaldra excels at making the most of her initial pass, then taking advantage of her Pulse Ray Shield once she's safely out of range of enemy fire. 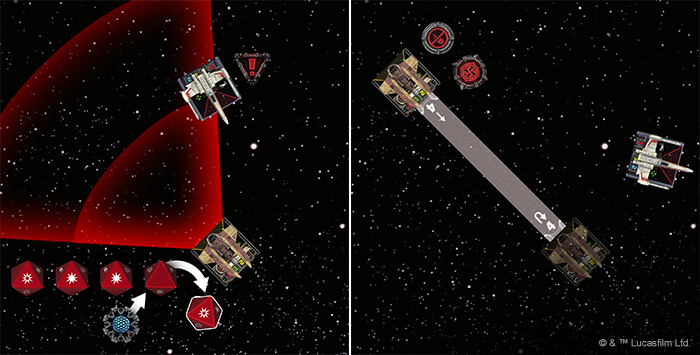 These sort of hit-and-run tactics gain further ammunition with the release of the Arc Caster cannon. 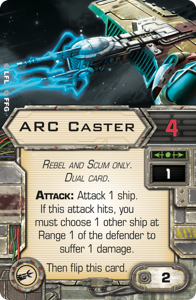 Although the Scyk can use the cannon only if it has first equipped the "Heavy Scyk" Interceptor Title, the Arc Caster rewards skillful piloting with potent, close-range attacks that can damage not only a primary target, but also another enemy within Range "1." The Arc Caster isn't just notable for the damage it can deal. It's also noteworthy for the fact that it has to recharge. After you fire this dual-sided cannon, it flips to its Recharging side, and it can only flip back if you take a weapons disabled token. 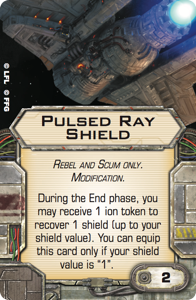 Accordingly, the Arc Caster makes a natural partner to the Pulse Ray Shield in any Syck squadron making use of hit-and-run tactics. 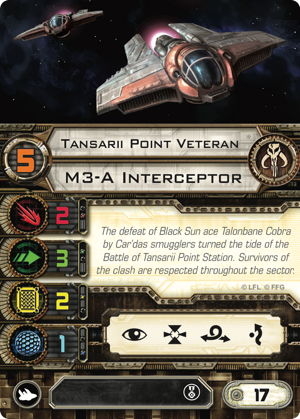 Of course, Inaldra isn't the only notable character in the C-ROC Cruiser Expansion Pack to emerge from the legend of Tansarii Point. 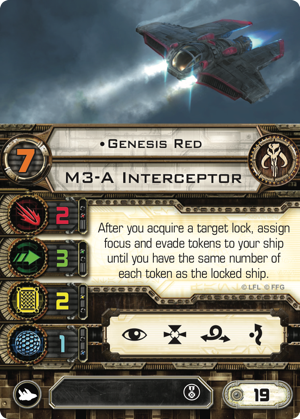 Rival crime lord Genesis Red had his own designs amid the chaos of the battle of Tansarii Point, and he carries his scheming into X-Wing with the ability to load up with as many focus and evade tokens as any ship on which he acquires a target lock. 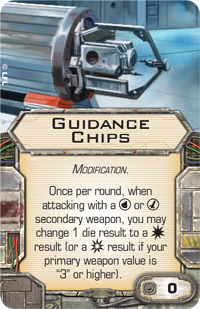 Among other things, it means that any squadron leader looking to get the most of Genesis Red should consider flying him against an opponent's most defensive ships and then use his actions and elite pilot talent upgrade to focus on positioning or offense. 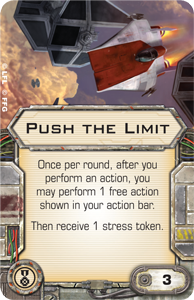 With Push the Limit , for example, Genesis Red might want to target lock a token-loaded ship like Colonel Vessery's TIE/x7 and then barrel roll into a more favorable position. Or he might simply forgo the extra action in favor of the extra damage potential granted by Fearlessness . 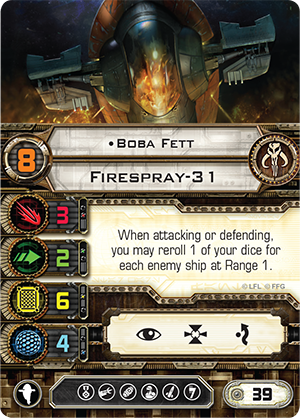 Yes, there are dice in X-Wing, and there are good feelings and bad feelings in the Star Wars universe. 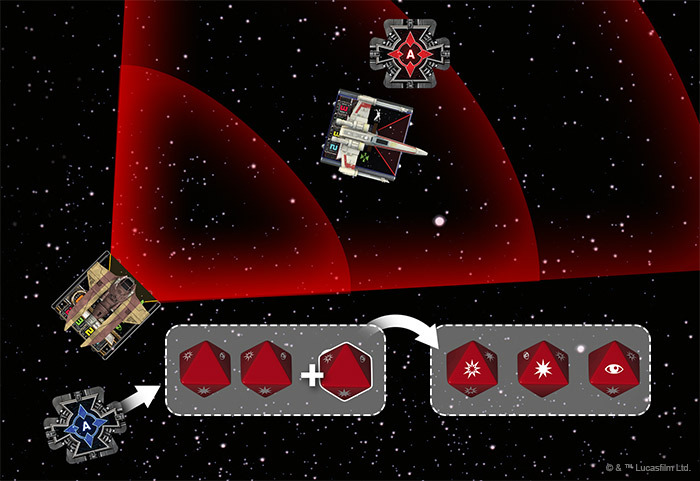 Call it what you will, luck—or chance or fate or destiny—is as much a part of your Star Wars space battles as are your fighters and pilots. Typically, top players are able to minimize the impact of luck by way of skillful piloting and the use of effects like focus and target lock that can modify their attack and defense rolls. 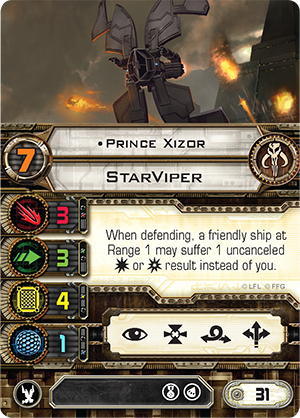 But one of the new Scyk pilots is willing to gamble everything on chance. The name of this daring, "double or nothing" pilot is Sunny Bounder , and she's a swoop racer and thug. For the right price, she's also willing to take the cockpit of an M3-A Interceptor. And when she does, she "doubles" the result of any dice roll that's all matching results by adding another result of the same sort. Naturally, her ability is great when you roll four hits with your Heavy Laser Cannon and get to add a fifth. But it's also considerably less likely to trigger that way than if you were to keep her in a "Light Scyk" Interceptor with only two attack dice. 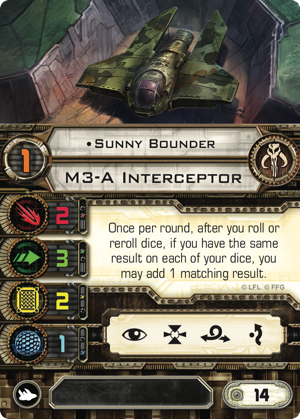 Two hits from two dice is by no means an uncommon result, and Sunny Bounder can make it three. 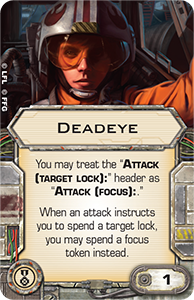 Likewise, if you're lucky enough to roll three evades—or three focus results when you have a focus token—Sunny Bounder is the only Scyk pilot with an innate ability to emerge unscathed from an encounter with Miranda Doni's five-hit Proton Torpedoes . But the truth is that you sometimes roll blanks, and if you're like many of us, you'll whiff on both your attack dice as often as you roll hits with both—despite the fact the whiff is far less probable a result. Fortunately, Sunny's luck is good even in this situation; when you whiff on your attack, Sunny adds a third blank, and then you can reroll all three dice with your target lock. 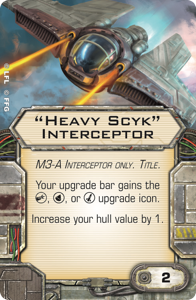 Finally, where all the other Scyk pilots tend to equip cannons to their "Heavy Scyk" Interceptors, the last of the new aces from the C-ROC Cruiser Expansion Pack is more inclined to equip missiles or torpedoes. Despite the number listed on her ship card, Quinn Jast isn't really an eighteen-point pilot. She's really more like twenty plus the cost of whatever missile or torpedo upgrade you wish to equip. And why not? 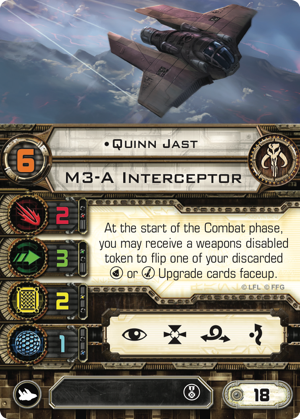 You could play Quinn Jast without putting her in a "Heavy Scyk," but then you wouldn't get anything from her unique pilot ability—the one that could potentially allow you to wipe out your enemies with repeated volleys from her Proton Rockets or Proton Torpedoes. 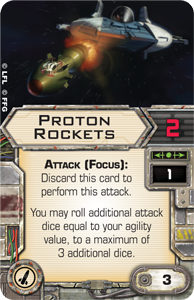 With the "Heavy Scyk" Interceptor upgrade, Proton Torpedoes, Deadeye , and Guidance Chips , Quinn Jast makes a great twenty-five point flanker. 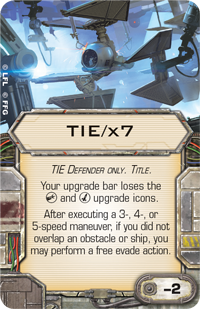 It's true that Quinn Jast suffers from the same vulnerability as every Scyk pilot; the ship's single point of shielding doesn't offer much protection after your opponent is able to land a hit past your agility. However, she can hit hard enough for twenty-four or twenty-five squad points that your opponent can't afford to ignore her, and that makes her a great flanker in a list that still has seventy-five or seventy-six points to spend on the main thrust of its attack. And in the end, isn't the chance to obliterate your enemies with precision rockets well worth the risk? 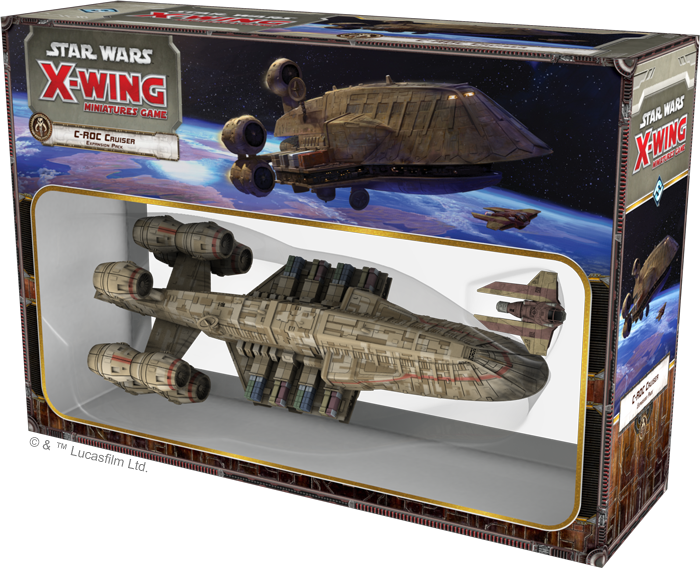 This is X-Wing, and it's the game of dramatic dogfights in the Star Wars galaxy—a place of overwhelming odds and desperate heroics. 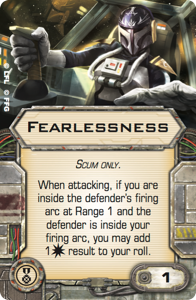 The galaxy's Scum and Villainy aren't often prone to the traditional variety of "heroics," but their ranks are nonetheless filled with legendary figures such as Boba Fett , Bossk , Dengar , and Prince Xizor . And at times, even smugglers and pirates can band together in heroic fashion. Such was the case in the legends of Tansarii Point Station, and survivors of the battle have earned respect throughout the Bright Jewel system. Soon, you'll have the chance to better understand how a handful of pirates in Scyks were able to withstand the Black Sun. 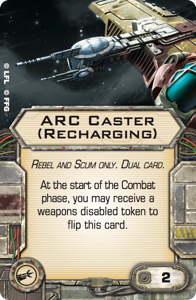 When the Scum faction goes Epic with the C-ROC Cruiser Expansion Pack, you'll gain the chance to fly some of the galaxy's most notorious Scyk pilots in your X-Wing battles. How will you incorporate them into your squads? Share your thoughts with the members of our community forums. 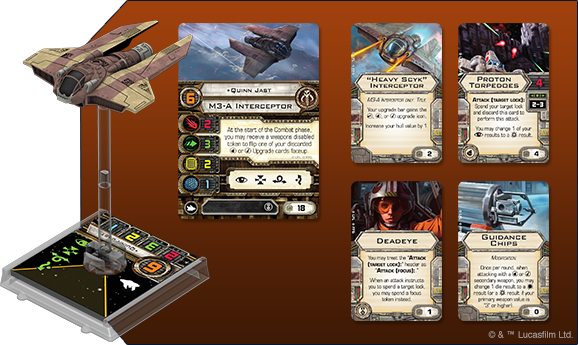 Then head to your local retailer to pre-order your copy of the C-ROC Cruiser Expansion Pack today!